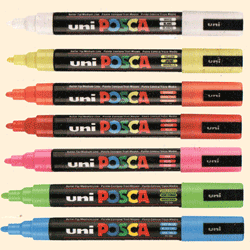 Solvent free, non toxic paint pen, this is the brand used by beekeepers worldwide. It can be useful to colour date code the queen bee but it does not always make her easy to find. A yellow marked queen can be easily missed amongst pollen laden workers but double marking with a second colour can make her stand out from the crowd. Marking with two or more colours also provides a way of uniquely identifying queens.